Kelly Hancock | "In good writing, WORDS BECOME ONE with things." The region along Italy’s west coast is so spectacular, so stunningly beautiful and exceptional that when asked what it’s like, it’s hard not to sound like your IQ is dangerously nearing single digits. “So it’s a beach town,” the skeptic says. “So it’s crowded?” they continue. “So it’s a beach you can’t get to, it’s overcrowded, and I have to walk everywhere?” they say, turning away. “……. (sigh in defeat),” say you. 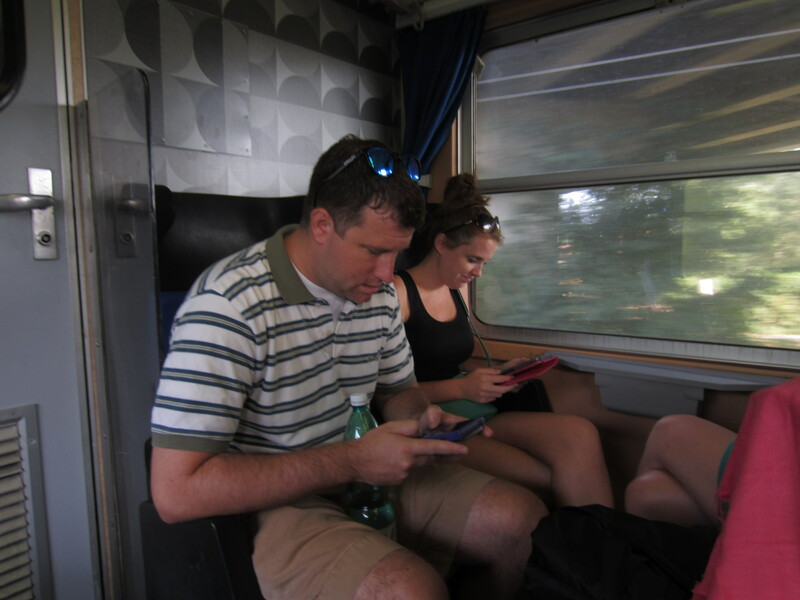 This was a little of our dynamic the day we took the train to Cinque Terre from Lucca — it was Kelly, Amy and Brian’s first time, and the rest of us were trying to describe the majesty of the place, but failing miserably. Finally we decided to let it speak for itself and we settled back in our seats to read on our Kindles, or in Brian’s case, rescue the princess on his Gameboy Color. The train ride there is largely uninteresting, with slightly shabby towns pockmarked across stretches of fields. There is no evidence that soon one will be on the Mediterranean, much less in one of the most beautiful places on earth. We switched trains in La Spezia and rumbled through tunnels, the last of which ended with a split-second view of the water making everyone gasp and dive toward the window. We knew we were close and became giddy at the thought of the day ahead. 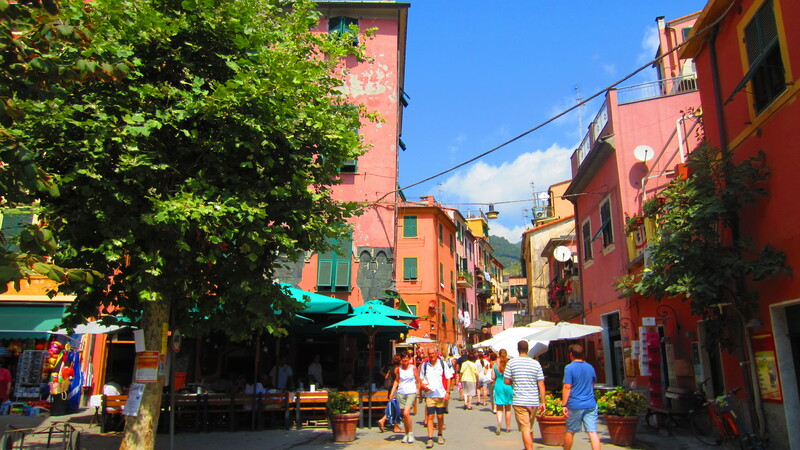 After getting off the train and purchasing our return tickets, we walked down the stairs from the station into the first town — Monterosso. The sight stopped us in our tracks. It was even more spectacular than I remembered — rich colors filling every inch of the landscape, enormous emerald hillsides reaching out of cobalt waters like cathedral ramparts, tanned Europeans lounging under brightly striped umbrellas, relaxed tourists sipping wine and licking gelato before noon. It was paradise. We were so overwhelmed we didn’t know what to do first. Erin and I walked around to re-familiarize ourselves with the place, while Brian lead Amy, Mike, and Kelly to the nearest tropical drink shack to celebrate our arrival. Soon we all had handmade smoothies, some with booze, some without. I made a quick pronouncement. I got signed contracts from everyone in the form of happy grins. 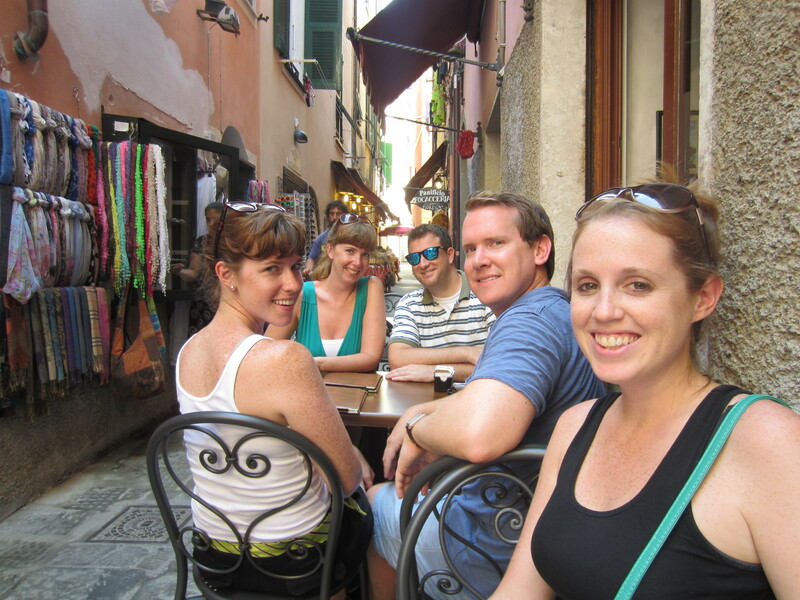 Erin, Mike and I had extremely fond memories of a particular bruschetta restaurant in Monterosso, and we were determined to return. 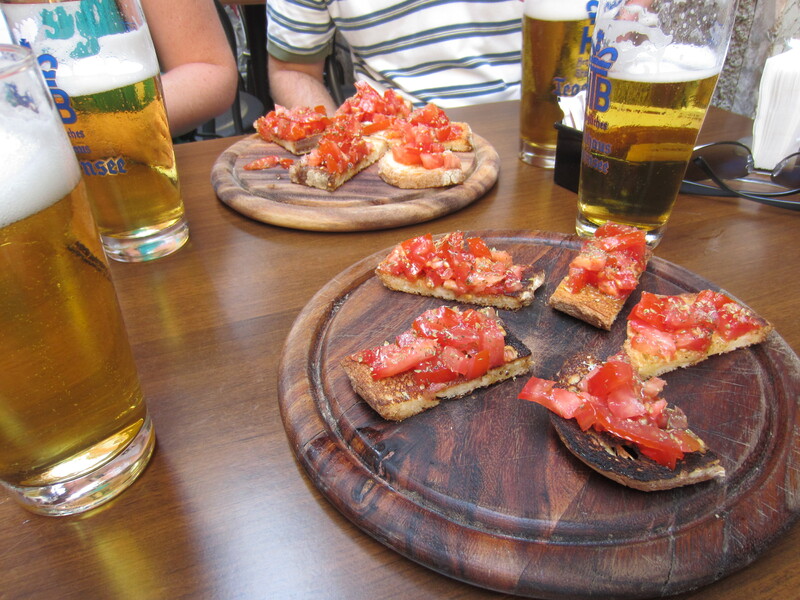 After exploring the town a bit more, we headed off in search of the perfectly toasted bread, tomatoes drenched in olive oil and basil, and the perfectly proportioned dusting of sea salt. When we found it, right where we’d left it three years earlier, we shouted a little for joy. When it was even better than we remembered, we felt appropriately validated. Kelly, who avoids gluten, was beside herself at being able to savor this treat with abandon. It turns out that Italians don’t modify their wheat the same way we do stateside, so even those who can’t eat gluten can eat it in Italy. As if Italy weren’t perfect enough? 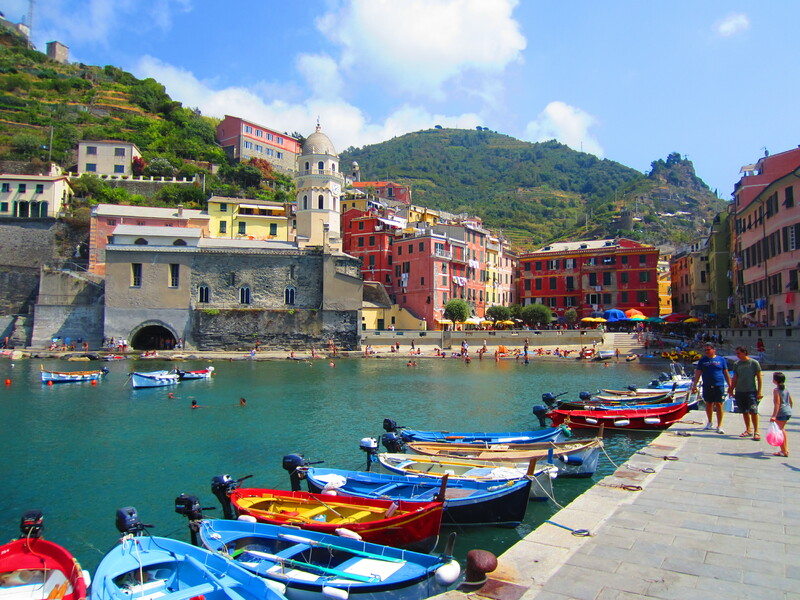 Next we hopped on the train for village number two, also known as Mike’s favorite: Vernazza. 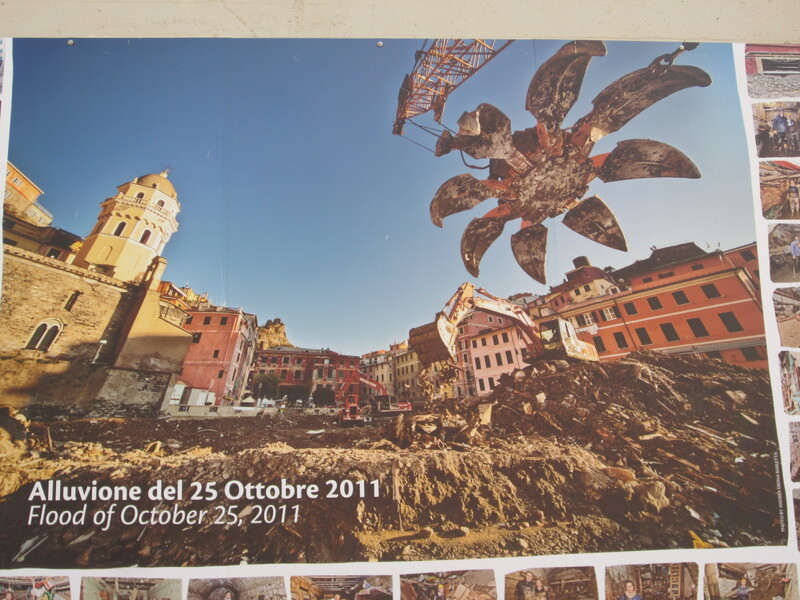 As we walked through the quaint town of small shops, we saw a large poster commemorating the disastrous mudslide that rocked the town a year ago. It was hard to believe that 18 feet of mud covered where we now stood. 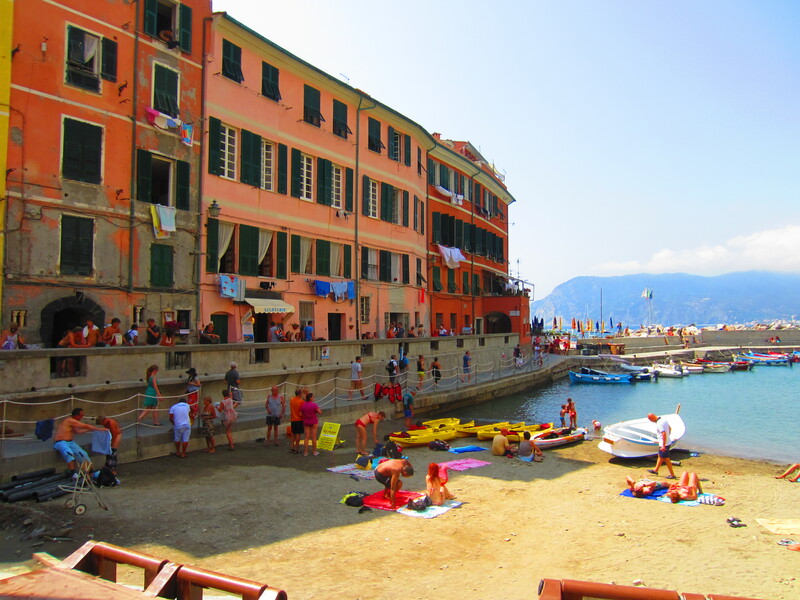 When we reached the center of town lining the beach, it was like stepping onto a movie set. 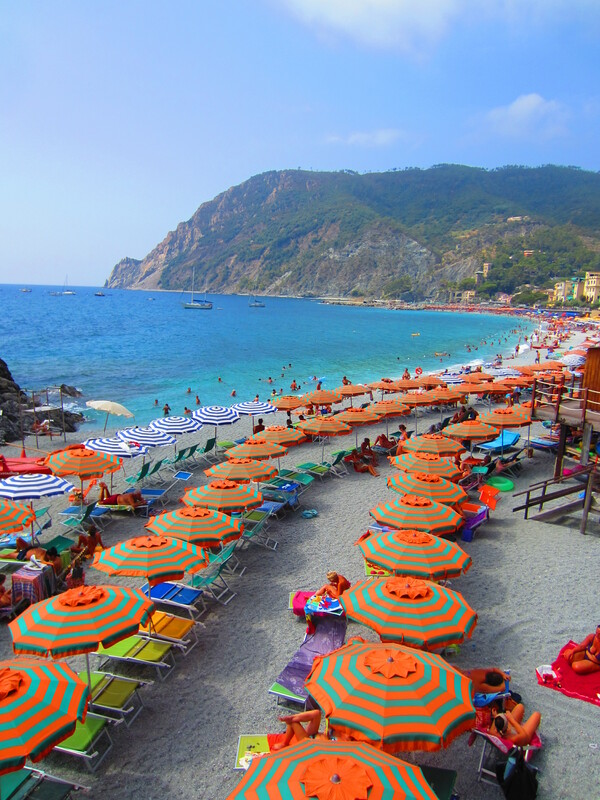 It was so colorfully radiant, so decadent in leisure, and so unaffected by tourism; if this place were almost anywhere else, there’d be cheap carts set up everywhere with key chains and towels and hats with I’VE BEEN TO CINQUE TERRE printed garishly across the front. Instead, it seemed perfectly untouched, as if we were the first to discover this European heaven. We wandered off to take pictures, enjoy the view, and walk along the rocks in the water. Before I knew it, Amy came up behind me and made a little announcement. “Brian went swimming,” she said. “Wha — he didn’t bring a suit!” I replied. “Apparently that’s not a problem for our Bri Bri,” she said. And it wasn’t. Up walked Brian, dripping wet in the 90 degree weather, wearing the expression of a child with a free unlimited tickets to Disneyland. It took about two seconds for Mike to light up like a rocket, a bigger explosion of excitement than if he’d seen a dozen puppies. “I’m going in, too! YES! THIS IS AWESOME!” he hollered. 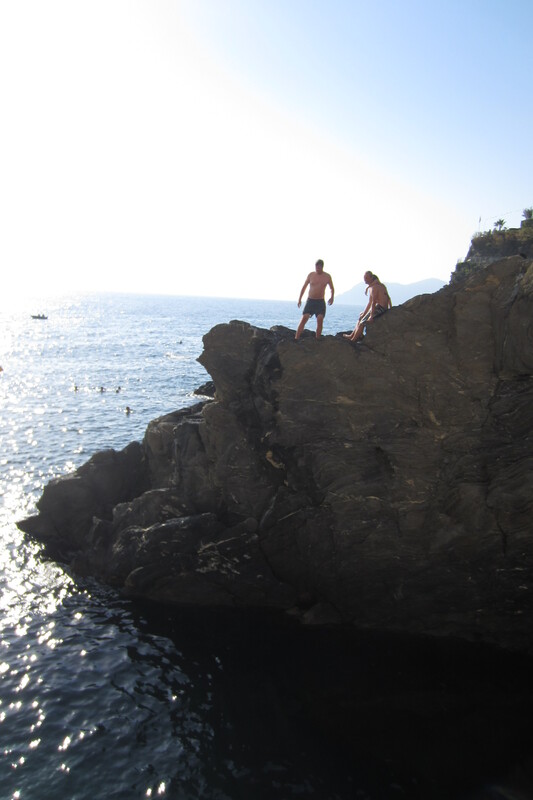 At first I was aghast at the idea of my husband running around in public in his underwear, but then I remembered I was in the Italian riviera, and people were changing in and out of swimsuits in broad daylight. Amy wasn’t far behind, having made the wise decision that morning to select undergarments that were both black and very swimsuit-like. Kelly, Erin and I were not as lucky, so we agreed to hold clothes and take photos. The joy radiating from their faces in the water was contagious. 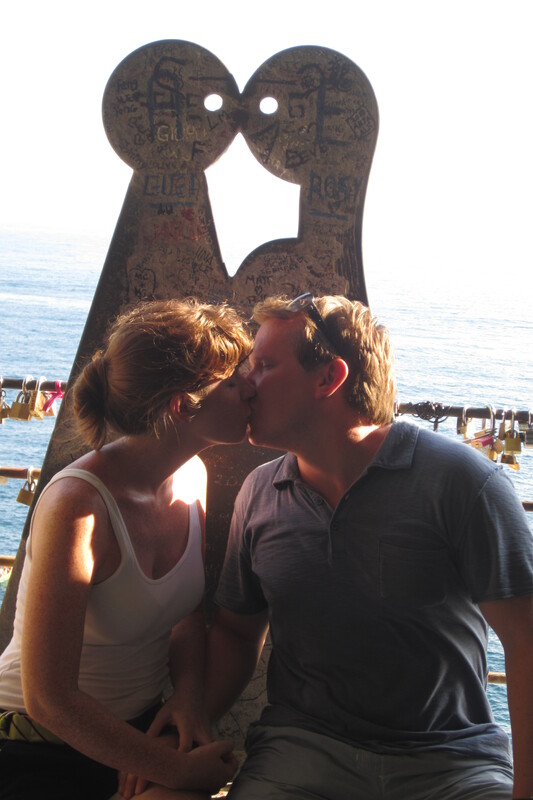 It was a moment that made us stop and recognize what was happening: we were all together in Italy, swimming in the Mediterranean, living a day most people can only dream of. We were so, so grateful. 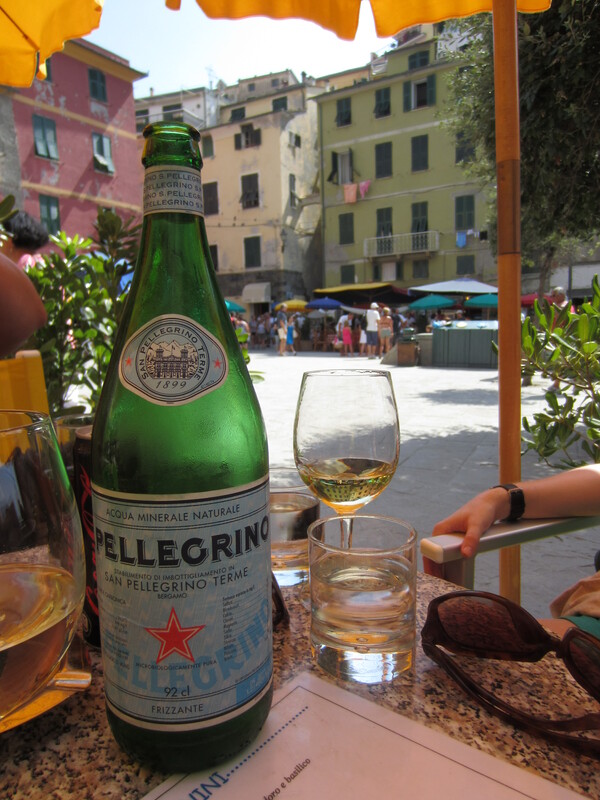 The good people of Vernazza kindly provided a hose to rinse off the salt, and the swimmers rinsed while we found a table for a glass of wine and refreshing Pellegrino. 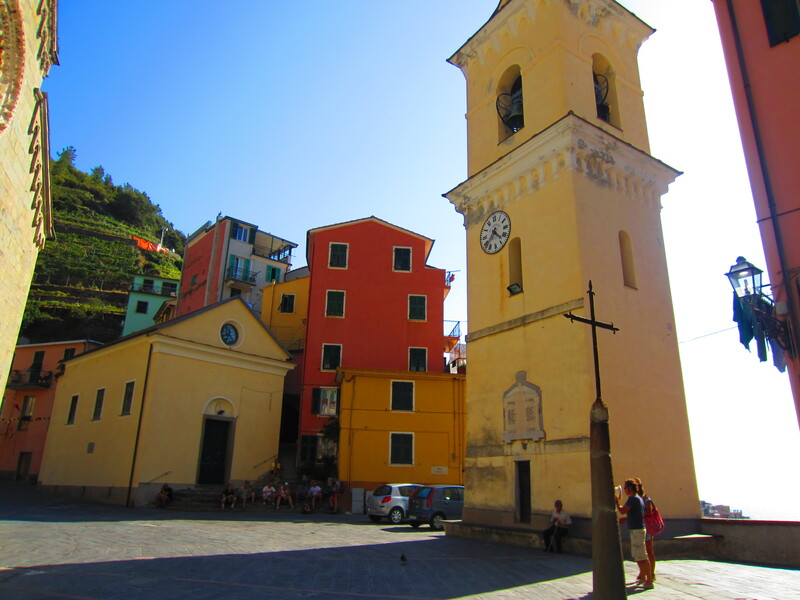 We stopped at the next train station, for Corniglia, but when we were told it was a 400 stair climb to the town, we immediately got back in line for the next train. It was blazing hot, we had two towns to go, and hiking up a hillside sounded laughably unappealing. 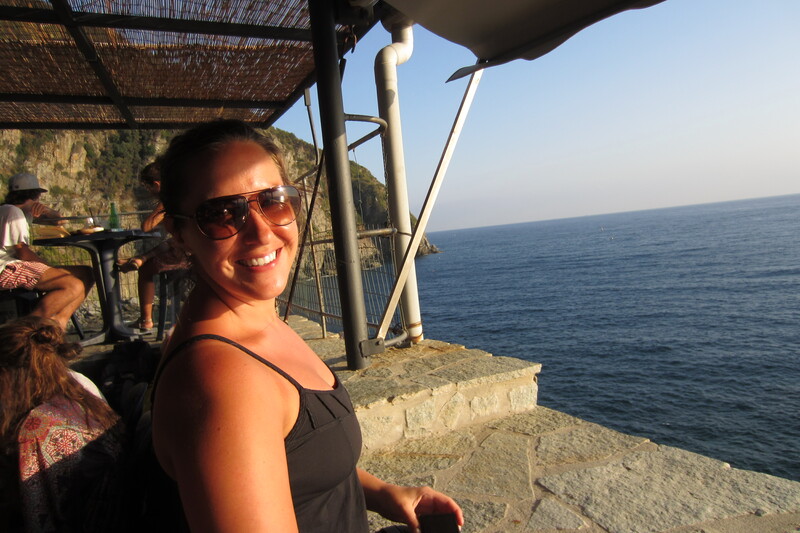 When we arrived in the fourth town, Manarola, we split up to explore and take photos. The girls combed the town, pointing out buttercream yellow buildings and hundreds-year-old churches. We posed for pictures by terraced vineyards so steep we marveled that the grapes were able to be harvested. We eventually found the boys exactly where we’d expected: having a cold lager on an outdoor deck. 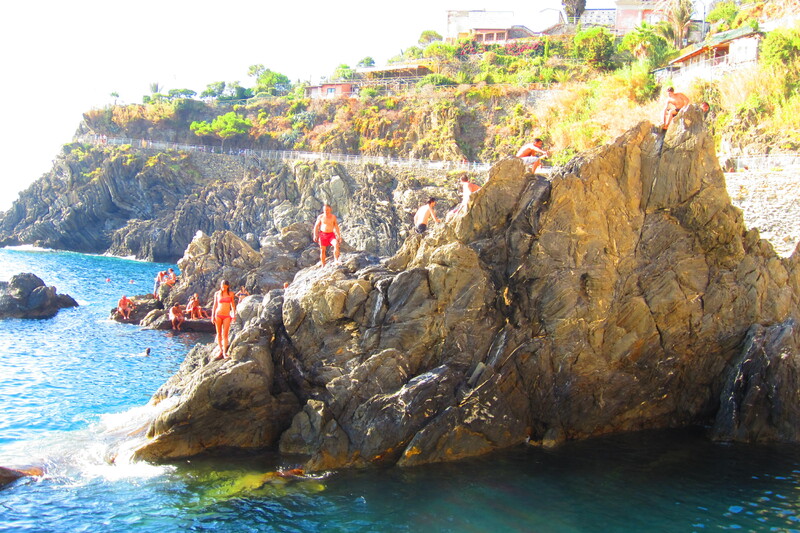 We walked to the water’s edge and saw dozens of people swimming among the rocks, some climbing dangerously high to free-fall into the aquamarine waters below. We couldn’t believe how high the cliffs were, and it made my palms sweat to watch them stand at the edge and dither about whether to jump. It wasn’t two minutes before Brian was again casting off clothing and descending the stairs into the water. We all watched nervously as he disappeared behind the black rock, with Amy calling for him not to kill himself. He flew through the air and we cheered when his head bobbed back up to the surface. His earlier prediction hadn’t been far off, for the landing ripped his shorts in half. Luckily he still had his clothes to throw on, so all was well. 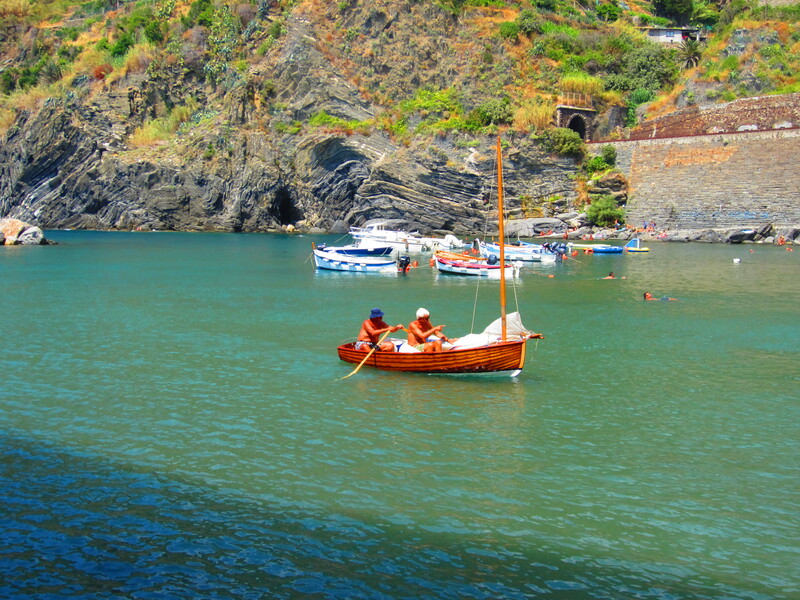 Our last destination was Riomaggiore, or as we nicknamed it, Rigamortis. 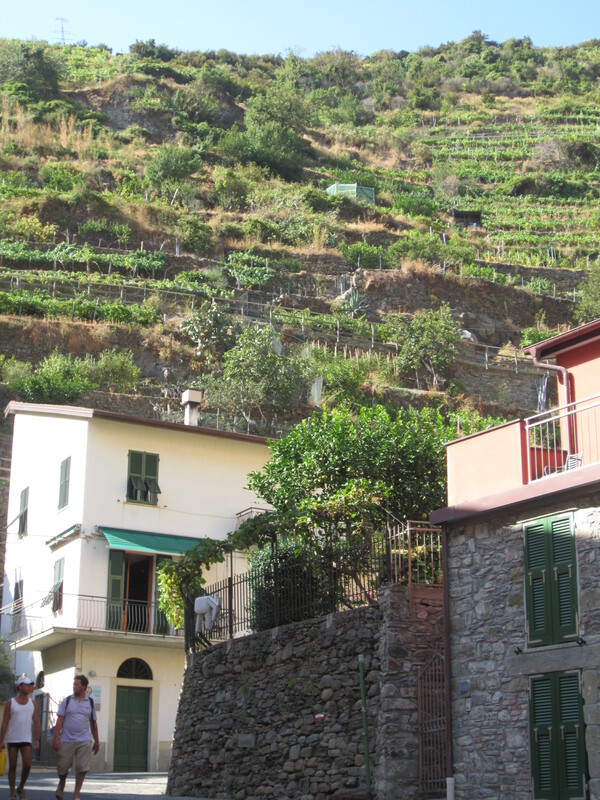 The path along the hillside to walk there is called Via dell’Amore, or The Way of Love. 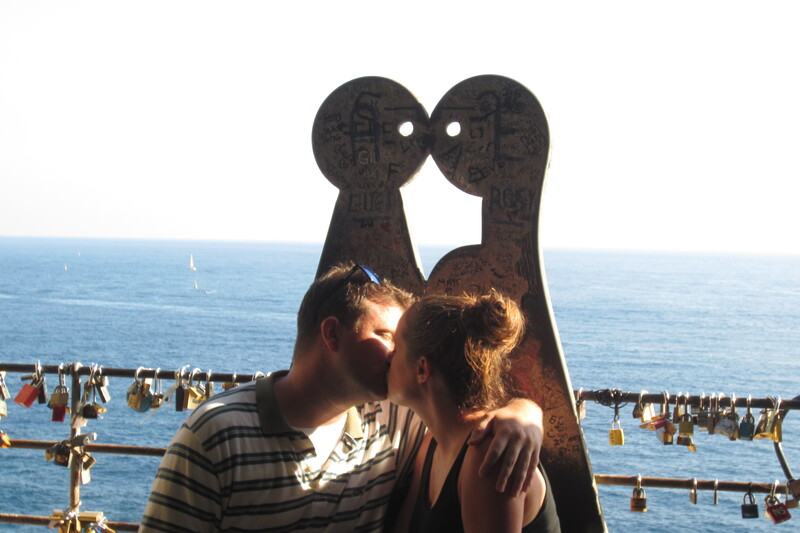 It’s a famous place for lovers to walk the kilometer-long road and take in the spectacular view and dedicate their love by putting a lock into the fence (Sam and Aaron did this on their walk with Dave and Nancy). Mike and I took a photo there in 2009 and decided to recreate the moment in 2012. We semi-forced Amy and Brian into the same thing, which they only found mildly cheesy. In our final quest for food we were hoping for a real meal, but truly came up short in ways we couldn’t have thought possible. We found the most stunning location, a restaurant high on the hill built into the rock, overlooking the ocean so forcefully it was hard to look away. But the food. My word, the food. 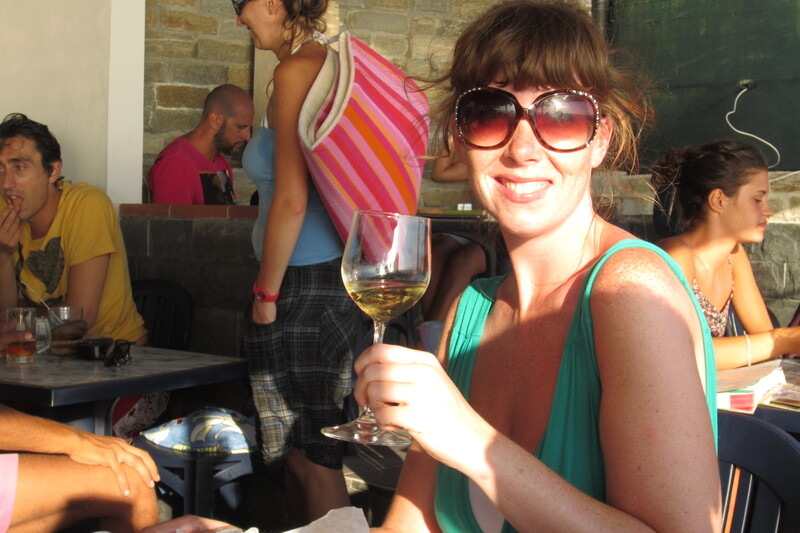 We ordered as best we could, and made up for it with glasses of white wine, but there was little that could be redeemed. It was completely obvious that there was no kitchen in the establishment, just a bar down a steep flight of stairs that presumably held a freezer full of frozen entrees and a good stock of booze. The entirety of the restaurant’s appeal was its location. But honestly, there would be no true complaining from any of us. We knew we were sitting on top of the world on one of the best days any of us would have as long as we lived, and a thawed panini wasn’t going to shave an inch off our ecstasy. I could tell you that our day in paradise ended with missing a train connection in La Spezia and having to spend 100 euro on taxis to get us all home. I could, but I won’t. With a day like that, even with an ending that makes a tightwad like me want to light my hair on fire, I will never regret a second. Doing so creates a person who wins the lottery only to whine about the taxes. 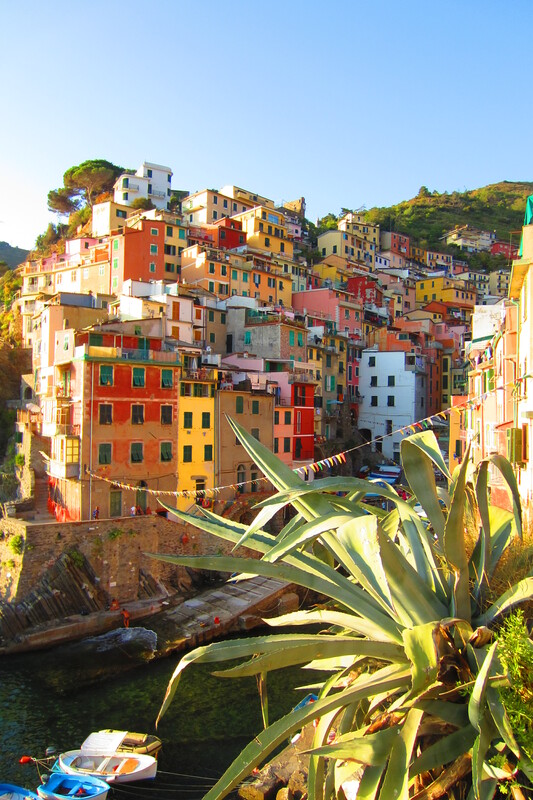 Le Cinque Terre, a place so magical you’ll be filled with envy on behalf of every other place in the world that calls itself beautiful.